The Omega Men story arc comes to a conclusion in this issue, with some surprising twists along the way. I had kind of hoped this was another attempt at a reboot for the series, with formerly dead members returning as clones. But nope, I was mistaken. The cloned Omega Men are just weapons being used by Harry Hokum. It’s still a really fun story, though, and just because my guess was wrong it didn’t decrease my enjoyment of the tale. As much as I love Adam Hughes’ art, I have to admit that Eduardo Pansica and Julio Ferreira are better suited to the resolution of the Omega Men storyline. This is a battle heavy, intense issue, and the pair give a grittiness to it that really adds a lot. In fact, there is nothing that I didn’t like about this issue. By the end a romantic triangle is forming, one that I hope gets maintained for a while. Harry Hokum gets his comeuppance, and the long running Rogol Zaar plotline looks to be coming to a head next issue. 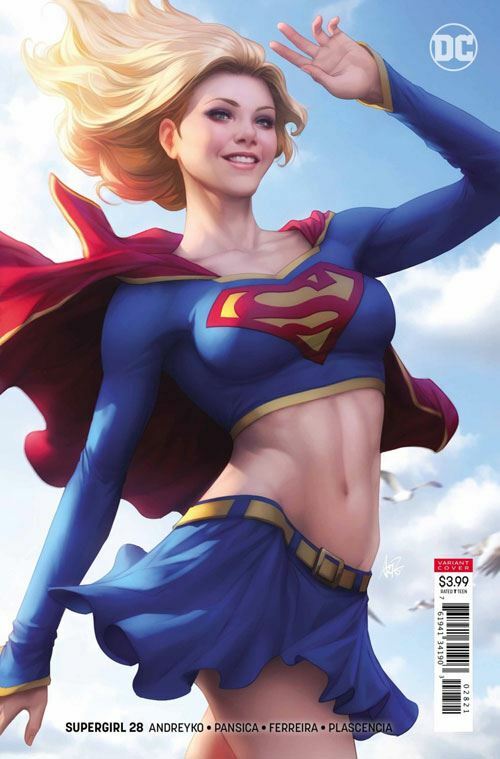 I would never have suspected that the Supergirl series could improve so much, simply by sending her out into space. But it freed the book of trying to match the tv series, and allowed us to see Kara operating in a new way. It makes me kind of hope they don’t just send her back to Earth at the end of this. There seems to be a lot more potential to the character the further she gets from Superman.